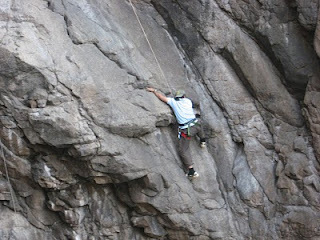 Picture a climber on a steep wall of rock face. Above him, the rock sweeps up like a cresting wave, without a single crack to lodge his hands or feet in. From our point of view, there appear to be no holds at all, just a polished wall; yet he moves steadily up - high stepping, counter balancing, reaching, ever fluid and graceful. He is face climbing, and to the beginner it looks harrowing. But you'll soon learn that face climbing is the most natural form in all the climbing game. It varies from low angle slabs, where balance and the friction of good boots are all that's required, to 120 degree overhanging test-pieces where Conan's strength is essential to even get off the ground. 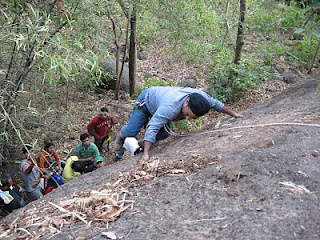 The first rule in face climbing is to keep your weight over your feet. We live much of our lives on our feet, better suited for load bearing that our arms, which tire quickly regardless of their strength. Keeping your weight over your feet's is the result of correct body position. On face climbs less than 90 degrees (or dead vertical), the body should remain in the same upright posture as when you're walking on level ground. 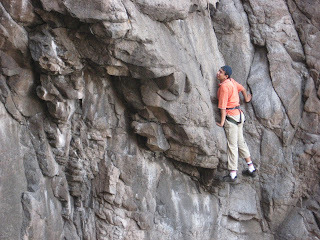 Another ground rule always maintain three point contact, practice, practice, practice on boulders, rock faces. But never do it alone. 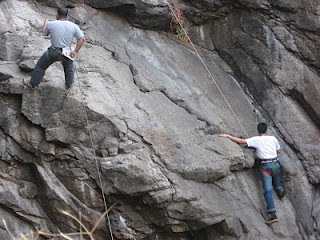 Climbing is a team sport and should be done in company of at least two experienced climbers. So get adventurous and explore one more dimension to your life.